"Has GPS tracking to locate your dog within the range of your home or yard via the base station." "This small, lightweight tracker attaches to your pup’s one-inch collar or harness." "Suitable for dogs up to 50 pounds, and uses two leashes attached to one holder for less mess." "The Potty Bell by Caldwell’s Pet Supply Co. is 26 inches long and easily slips over a door handle or knob." "With built-in rubber backing and seat anchors, this waterproof cover won’t slip around even as your dog moves around." "This saddlebag style pack has two larger pockets for food and other gear needed for an overnight trip." "Made from a durable, quick-drying nylon that is lightweight and folds flat." "Has three modes of use: steady light mode, rapid flashing, and slow flashing." "This coloring book uses intricate designs and patterns to create beautiful dogs that you can spend hours coloring in." If your dog is allowed to roam freely in your yard, but you are still nervous about him or her escaping, invest in the LINK Smart Dog Collar by the American Kennel Club. The smart collar has GPS tracking to locate your dog within the range of your home or yard via the base station, or if they are lost outside of your borders. 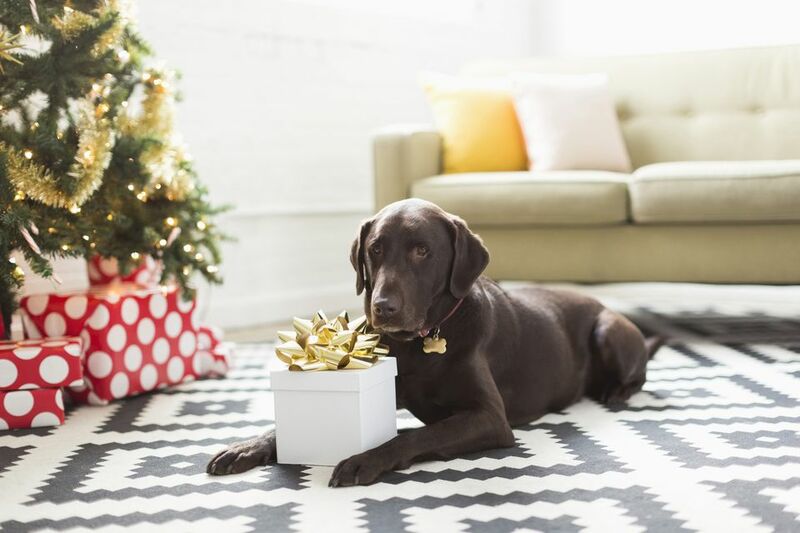 Just place the base station in your home, which also charges the collar, and get updated on your dog’s temperature, location in the house, and how many minutes a day they are active. Plus, the sleek collar also comes with a light that you can control from the app. The collar comes in small, medium, large, and extra large. The app is available for iOS and Android. LINK AKC subscription plans are sold separately. Another option for a GPS tracker is the Whistle 3 GPS Pet Tracker. This small, lightweight tracker attaches to your pup’s 1-inch collar or harness and is able to determine their location, as well as their active minutes throughout the day by using cellular, GPS, and wi-fi technology. If your dog leaves the designated safe place (say, your yard or your house), you’ll get notified right away via email, text, or through the app. The tracker is waterproof and has a battery life up to seven days. The app is available for iOS and Android. Subscription plans are sold separately. Walking two dogs isn’t always the easiest task. With Dual Doggie Pet Leash by Wigzi, your dogs won’t get tangled and neither will you. The leash is suitable for dogs up to 50 pounds, and uses two leashes attached to one holder for less mess. Both extend 10 feet, plus the holder has a stop button for each leash so you can manage each dog individually. Need some more help finding what you're looking for? Read through our best dog leashes​ article. Whether you’ve brought home an older dog from the shelter or just got a new puppy, teaching them to use a potty bell will help immensely with accidents. The Potty Bell by Caldwell’s Pet Supply Co. is 26 inches long and easily slips over a door handle or knob. From there, work with your dog to learn cue words about going outside to use the bathroom, and give them treats near the bell to get them to nose it. Eventually, they’ll learn to ring the bell whenever they want or need to go outside. Colors include black, blue, brown, green, red, and yellow. If you tend to take your dog on frequent adventures, investing in protection for your car will help with any muddy, mucky, or wet mess from your furry friend. The BarksBar Luxury Pet Car Seat Cover is ideal for cars without a trunk that they can hop into. The cover is convertible between a regular seat cover or hammock-style with full protection over the middle seats and back of the front seats, as well as the floor. There is enough space for your pooch to sit, lay down, or stick their nose up front. With a built-in rubber backing and seat anchors, the waterproof cover won’t slip around even as your dog moves around. Dogs love having a job to do, and with the Ruffwear Approach Full-Day Hiking Pack, your dog feels like they are working hard and you don’t have to carry their extra food. The saddlebag style pack has two larger pockets for food and other gear needed for an overnight trip, as well as smaller stash pockets for treats and poop bags. Integrated into the pack is a harness to keep the pack centered and sturdy, and allows for a leash to be attached on the front or on the back. The pack also has a padded handle and is made from a lightweight, durable material. Sizes include extra small, small, medium, and large. Colors include orange, green, and blue. For the active pup, a portable bowl is a must, especially on hot days or in dry areas. Use the Port-A-Bowl collapsible food and water bowl from Outward Hound. The bowl is made from a durable, quick drying nylon that is lightweight and folds flat. Size includes a 24-ounce bowl that holds 3 cups of food and is 3 inches high and 4.5 inches in diameter, as well as a 48-ounce bowl that holds 6 cups of food and is 3.5 inches high and 6 inches in diameter. Latch on this light-up collar the next time you are letting your pooch out for a late night bathroom break. The LED collar by Illumiseen is USB rechargeable (five hours of light after a one-hour charge) and has three modes of use: steady light mode, rapid flashing, and slow flashing. Colors include red, green, blue, orange, pink and yellow. Sizes range from extra-extra-small to extra-large. For your dog-loving human friends, gift the Dog Lover Adult Coloring Book. This coloring book uses intricate designs and patterns to create beautiful dogs that you can spend hours coloring in. Each page will help you relax more, just like your pooch does after a long afternoon spent at the park.